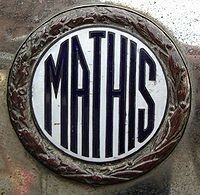 Mathis produced cars from 1910 till 1950 in Alsace, the company was founded by Émile Mathis. The first "true" Mathis model (8/20 PS) was put on the market in 1910, however the first real success came just before World War I with two smaller models: Babylette had a 1.1 L engine and Baby had a 1.3 L engine. There was also a Mathis-Knight model. During World War I, Mathis was sent by the German government (Alsace was then part of Germany) to Switzerland to buy tyres and after one of these trips he went to France and remained there. After the war Alsace became part of France and he was able to return to his factory. After the war, the firm's production increased quickly and soon became No.4 in France making more than 20,000 cars in 1927. Mathis attempted to compete with Citroën. The SB model of 1921 was followed by a six-cylinder model (1188 cc) in 1923 and an eight-cylinder in 1925. From 1927, Mathis followed a one-model policy. MY has side-valve four cylinder engine (1.2 L). Not surprisingly, the next year saw the Emysix, with a 2288 cc six-cylinder. The plant was eventually bought by Citroën in 1954.